Beautifully crafted Diamond Essence Solid Gold Jewelry. The timeless elegance of gold makes it the forever fashionable metal . We offer you a large selection of 14k gold rings with beautiful faux gems embelishmentsin the largest variety of colors, gold necklaces, fold bracellets and earrings . Choose a stunning solid gold piece to fit your style and make a fashion statement. Have an astonished look with these Diamond Essence Princess Cut Faux Diamond Earrings with square cut stones, 0.5 carat each, set in 14K Solid Yellow Gold. 1.0 carat t.w. Choice of 2.0 cts.t.w.,3.0 cts.t.w. and 4.0 cts.t.w. available. Solid gold backs are included. (Also available in 14K Solid White Gold, item# WEE1513). 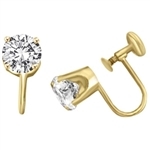 Diamond Essence Ear studs, 0.75 carat each, set in 14K Solid Gold-four prongs settings. 1.50 Cts.T.W. 14K GOLD SCREW BACKS. CHOICE OF YELLOW OR WHITE GOLD AVAILABLE. ADD SCREW BACKS AS AN ADDITIONAL ITEM TO ANY EARRING OF YOUR CHOICE. French Backs for non pierced ears. Available 14K Solid Yellow or White Gold. Choose from option menu. Stones or earrings not included. Diamond Essence Floral Journey Pendant, 0.30 Ct.T.W. In 14K Solid Yellow Gold. Approx Size Of Pendant Is 23 mm Length And 5 mm Width. 14K Solid Yellow Gold Diamond Essence Cross Pendant with Round Brilliant Melee set in delicate prong setting, 0.40 Ct.T.W. Approx Size Of The Pendant Is 29mm Length And 17mm Width. Diamond Essence Cross Pendent with Round Brilliant Melee, 0.66 Ct.T.W. in 14K Solid Yellow Gold. Approx Size Of Pendant Is 25 mm Length And 17 mm Width. Diamond Essence 14K Solid Yellow Gold huggies with Delicate Tension Set Round Brilliant Stones, 2.0 Cts. T.W. Diamond Essence Delicate Flower Leaf Design Earrings with Round Brilliant and Marquise Melee, 1.50 Cts.T.W. in 14K Solid Yellow Gold. Diamond Essence Delicate Flower Leaf Design Earrings with Round and Marquise Melee, 1.50 Cts.T.W. in 14K Solid Yellow Gold. 14k Yellow Gold Diamond Essence Solitaire Pendant With French Cut Rectangular Shape Amethyst Cushion Stone Set In 8 Prongs Decorated By Delicate Round Brilliant Melee On The Bail, 1.50 Cts.T.W. Approx Length Of Pendant Is 17mm And Width Is 6mm. Diamond Essence Marquise Cut stone, 05 ct. each, set in floral design, 3.0 Cts.T.W. in 14K Solid Gold. Diamond Essence Delicate Heart Pendant With Pave Set Melee. 1.30 Cts.T.W. In 14K Solid Yellow Gold. Approx Size Of Pendant Is 20 mm Length And 17 mm Width. Diamond Essence Cross Pendant with designer outring setting, 0.30 Ct.T.W. in 14K Solid Yellow Gold. Approx Size Of Pendant Is 30 mm Length And 15 mm Width. Free Vermeil Chain Included. Diamond Essence Solitaire Ring With Emerald Round Brilliant stone, 2 Cts.T.W. In 14K Solid Yellow Gold, a perfect solitaire ring. Diamond Essence Round Brilliant Melee set in heart shape carving on Cross Pendant, 0.15 Ct.T.W. in 14K Solid Yellow Gold. Approx Size Of Pendant Is 30 mm Length And 15 mm Width. Free Vermeil Chain Included. Diamond Essence Cross Pendant with bar setting Round Brilliant stones, 0.60 Ct.T.W. in 14K Solid Yellow Gold. Approx Size Of Pendant Is 32 mm Length And 15 mm Width. Diamond Essence 14K Solid Yellow Gold Huggies with Tension Set Tapered Baguettes, 3.50 Cts. T.W. Diamond Essence 14K Solid Gold Huggies with Princess cut stones, 2.50 Cts.T.W. Diamond Essence 14K Solid Yellow Gold Star Dangle Earrings with Round Brilliant Melee, 1.0 Ct.T.W. Diamond Essence Cross Pendant With Tension Set Round Melee, 0.30 Ct.T.W. In 14K Solid Yellow Gold. Approx Size Of Pendant Is 30 mm Length And 15 mm Width. Wide Band Solitaire Ring with 0.75 ct.t.w. of Diamond Essence Marquise cut stone, set in six prongs setting, 14K Solid Gold. Diamond Essence Cross Pendant With Round Brilliant Melee And Baguettes, Set Between Bars, 0.50 Ct.T.W. In 14K Solid Yellow Gold. Approx Size Of The Pendant Is 35 mm Length And 20 mm Width. Diamond Essence Ring with Brilliant Melee In Circular Pave Setting, 0.20 Ct.T.W. In 14K Solid Yellow Gold. Diamond Essence Ring With Round Brilliant Melee, 0.40 Ct.T.W. In 14K Solid Yellow Gold. Diamond Essence Ring with 1 Ct. Round Brilliant Stone And Melee Set In 14K Solid Yellow Gold, 1.15 Cts.T.W. Diamond Essence 18 Inch Long Nine Station Necklace With 4.2mm Each Pearl in 14K Solid Yellow Gold Chain. Diamond Essence Ring with 0.20 Ct. Each Round Brilliant Stone In 14K Solid Yellow Gold ZigZag Bezel Setting,1.60 Cts.T.W. Diamond Essence 14K Solid Yellow Gold Huggies, with Four Rows of Princess and Round Melee, 3.0 Cts.T.W. Diamond Essence Ring with 3 Cts. Asscher Cut center Stone and 0.25 Ct Trilliant Stone On Each Side, 3.50 Cts.T.W. In 14K Solid Yellow Gold. Three Stone Jaw dropping Ring -Lavender Essence 4.0 Carat Oval Stone in the Center and 2.0 Carat Diamond Essence Oval Stones on each sides, 8.0 cts. t.w. in 14K Solid Gold. Diamond Essence 1.25 Cts.T.W. Round Brilliant Bezel Set Solitaire Ring in 14K Solid Yellow Gold. 14K Yellow Gold Huggies With Two Row Of Channel Set Princess Cut Diamond Essence Stone, 1.40 Cts.T.W. Diamond Essence Five Stones Ring, With Round Brilliant Stones In Graduating Size, 1.80 Cts.T.W. In 14K Solid Yellow Gold. Diamond Essence Drop Earrings With Wire, 2 Cts. Each Round Brilliant Stone With Melee Around And On Bail, 5 Cts.T.W. In 14K Solid Yellow Gold. Diamond Essence Three Princess Stones Ring with 1.50 Cts. Center and 0.25 Cts. on each side,2 Cts.T.W. set in 14K Yellow Gold. Browse the extensive selection of high quality 14k gold jewelry from Diamond Essence. This stunning simulated diamond jewelry, including 14k gold rings, necklaces and earrings, is an exceptional deal. Similar to gold cz rings, the 14k gold rings found at Diamond Essence are only a fraction of the price. However, Diamond Essence 14k gold rings are much higher quality than normally gold cz rings. The gorgeous 14k gold rings and gold necklaces for women and men only contain simulated diamonds that are of the highest color, clarity and cut. Find the perfect sparkling simulated diamond in 14k solid gold below and purchase today with same day shipping. Call the Diamond Essence experts at 1-800-909-2525 if you need help picking out a beautiful piece of 14k solid gold jewelry.